Research published* in the May 6 issue of Science indicates that slow-motion earthquakes or “slow-slip events” can rupture the shallow portion of a fault that also moves in large, tsunami-generating earthquakes. The finding has important implications for assessing tsunami hazards. The discovery was made by conducting the first-ever detailed investigation of centimeter-level seafloor movement at an offshore subduction zone. “We’ve previously used land-based instruments to detect slow-slip events, but this is the first time we’ve been able to document slow slip in the shallow portion of an offshore subduction zone. With instruments on the seafloor right above the plate boundary, we now have very high-resolution mapping of where the slip occurred,” said coauthor Susan Schwartz, professor of Earth and planetary sciences at UC Santa Cruz. First author Laura Wallace, a research scientist at The University of Texas at Austin’s Institute for Geophysics, led an international team of researchers from the United States, Japan, and New Zealand in the collaborative research project. “These data have revealed the true extent of slow-motion earthquakes at an offshore subduction zone for the first time,” said Wallace, who earned her Ph.D. at UC Santa Cruz in 2002. The world’s most devastating tsunamis are generated by earthquakes that occur near the trenches of subduction zones, places where one tectonic plate begins to dive or “subduct” beneath another. 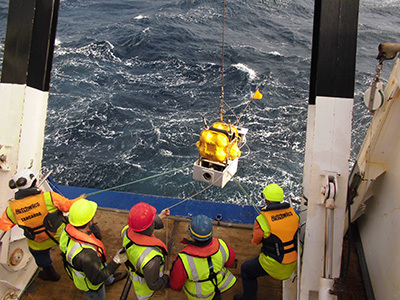 Using a network of highly-sensitive seafloor pressure recorders, the team detected a slow-slip event in September 2014 off the east coast of New Zealand. The study was undertaken at the Hikurangi subduction zone, where the Pacific Plate subducts beneath New Zealand’s North Island. 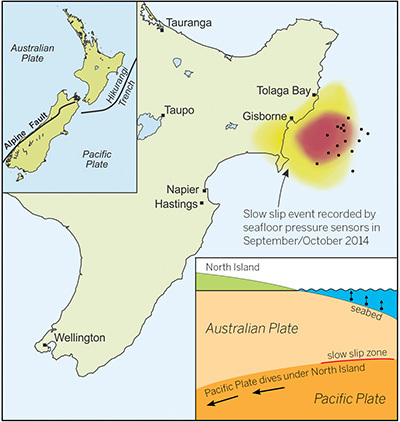 The slow-slip event lasted two weeks, resulting in 15 to 20 centimeters of movement along the fault that lies between New Zealand and the Pacific Plate, a distance equivalent to three to four years of background plate motion. If the movement had occurred suddenly, rather than slowly, it would have resulted in a magnitude 6.8 earthquake. The seafloor sensors recorded up to 5.5 centimeters (about 2 inches) of upward movement of the seafloor during the event. Slow-slip events are similar to earthquakes, but instead of releasing strain between two tectonic plates in seconds, they do it over days to weeks, creating quiet, centimeter-sized shifts in the landscape. In a few cases, these small shifts have been associated with setting off destructive earthquakes. The slow-slip event that the team studied occurred in the same location as a magnitude 7.2 earthquake in 1947 that generated a large tsunami. The study shows that the two types of seismic events can occur on the same part of a plate boundary. According to Schwartz, the demonstration that pressure sensors on the seafloor can be used to accurately measure the deformation associated with slow-slip events is an important proof of concept. “The ultimate goal is to map the mechanical properties of the shallow plate interface and understand what areas have the potential to slip in ways that produce damaging earthquakes, tsunami-generating earthquakes, or slow slip,” she said. Earthquakes are unpredictable events, Wallace said, but the linkage between slow-slip events and earthquakes could eventually help in forecasting the likelihood of damaging earthquakes. “To do that we will have to understand the links between slow-slip events and earthquakes much better than we currently do,” Wallace said. The research team installed the HOBITSS network in May 2014, which consisted of 24 seafloor pressure gauges, and 15 ocean bottom seismometers. The team collected the devices and data in June 2015. Additional participants included scientists from the University of Tokyo, Tohoku University, GNS Science, and the University of Colorado Boulder. The research was funded by the National Science Foundation; the Japan Society for Promotion of Science; Japan’s Ministry of Education, Culture, Sports, Science and Technology; and grants from participating universities and research institutions.